Milking cows- I previously knew very little about dairy farming as I come from a background in vegetable and livestock farming. Farm management- many of the farms I stayed at were more than happy to show me business structure and how they run their farms. 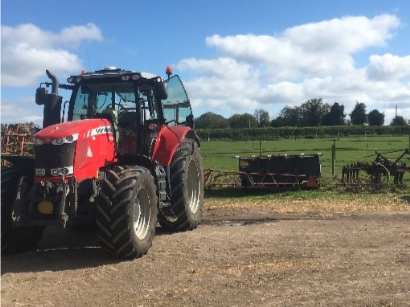 New machinery skills- I got many chances to drive machinery I wasn’t accustomed to, a wide range of machinery brands including Massey Ferguson, John Deer, Cat, Case Valtra, Fendt, New Holland and Steyr with all kinds of implements. Public speaking and people skills- I was given many opportunities to build on these skills, I quickly found myself talking at rural youth clubs and speaking at dinners. But it wasn’t all work - I was shown many sites by the Young Farmers and also in my travels. 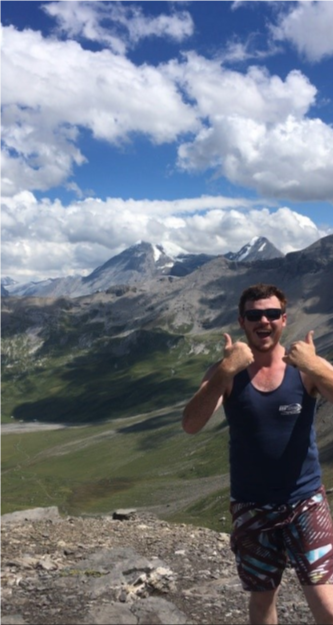 Stonehenge, Chatworth House, Giants Causeway, Slemish, Mt Snowden, Orkney islands, Swiss Alps. I travelled through many big cities like London, Belfast, Dublin, Edinburgh, Helsinki, Oxford, Salzburg, Zurich along with many others. All in all I am very grateful for Tasmanian Country’s contribution to making this trip so fantastic, There is definitely going to be a return trip or two, there is so much more to see and do I could spend the whole 5 months in the UK and not see it all. I hope that I have and will inspire others to go on exchange whether it is incoming or outgoing, I hope their experience is as good as mine has been. The first day of my trip was the biggest day of my life, I flew out of Launceston at 1:30pm on Friday, the plane was late landing in Melbourne which was an issue because I only had 1 hour and 50-minute stop over with the original flight time. With a quick bit of leg work I cleared customs and 2 security checks, I had 5 minutes in the lounge and I was onto the plane to Dubai. The flight took around 14 hours which I was unable to sleep on. I landed in Dubai midnight their time, it was 28 degrees and very humid. I had another quick trip to the next terminal, once seated on the plane our flight was then delayed and we sat on the runway for 30 minutes. I managed to have a quick sleep but as soon as we took off I woke up. Dubai to Heathrow was about 8 hours, I landed at 7:30 into Heathrow, very sleep deprived at this point. I was met in the arrival lounge by Jack Hawkins, a member from the local young farmers club. From there we travelled to the first host family the Dickinson's just out of St Albans. I had enough time for a shower then we were off to the point to point horse races, which is a cross country style horse race where it’s all about betting on the horse races. Returning to the family farm I managed to get an hour sleep before I was shook awake and informed of a trip to the pub for tea. We returned to the house at 1:00am Sunday morning - this completed my first day. Over the following week, I spent my time looking around the farm and sites, such as the Broadbalk Experiment where they have been growing wheat for the last 174 years. One strip has had no assistance and a lot of the seed fails but 3 meters away with fertilisers and assistance it has thrived for years. I also spent some time with a field vet where we did some work with dogs. I even saw an escaped kangaroo from the zoo running around a farm on our travels. I met with the rest of St Albans Young Farmers club with whom I travelled to the National Young Farmers Annual Convention in Torquay, sponsored by Massey Ferguson. 5500 Young Farmers descended upon a small sea side town (big town for us) called Torquay, there we had three days and three nights of entertainment. During the day, the main AGM conference with guest speakers, challenges and competitions. Also, there was many pubs and clubs that were open all day and night. Of a night, the main venue was a night club with 6 bars, 2 main rooms with dance floors. One of the rooms had a band and the other with a radio 1 DJ. On Monday, I left Torquay going past Rachel Branch family's farm, (Rachel is a recent English exchangee to Tasmania). 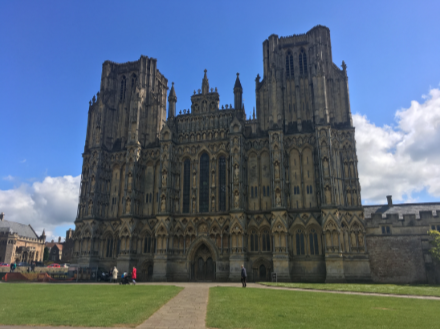 Darcy Toholke (Tasmanian friend) was also staying at the Branch's and we spent the week sightseeing Stonehenge, The White Horse, Bath, Wells, Chetta Gorge, The SS Great Britain and Bristol. I also got a chance to see some dairy farms, stock and arable farms. Next Monday, it was a public holiday for the Somerset show, it is very much a country show with equestrian events, stock judging, sheep shearing, cattle handling, tractor pull, livestock judging, machinery sales, craft tent and clay target shooting. From there I continued to Derbyshire, staying on the Adams family farm. After a 2-hour train ride through the English countryside, Richard picked me up and we went out to their dairy farm where I spent the full week. A steady week of farm jobs, hedge building and site seeing. We went to the Chatsworth estate, home to the Duke of Devonshire. The place was more like a palace, it was huge. While there we got to do a tour of part of the house. Thursday night was an event planning meeting where I got some new ideas for Rural Youth. On Saturday night, we went out for tea in Derby and then out for some drinks. Then Sunday I was on the plane heading to Northern Ireland. My time in Northern Ireland was a very interesting time! I flew from England to Belfast, and by the time I landed I was feeling a little unwell. Mitchell Park was my first host and he picked me up from the airport. Mitchell, with his father and brother, own a dairy farm in Ballymena. On Monday, we milked and fed cattle in the morning, and cut silage throughout the day. That evening we bailed and carted the rounds back to the yard about 8km on the road. I brought my last load into the yard at 1am. The rest of the week consisted of farm jobs and site seeing, we went to Bush Mills Whisky Distillery for a tour and Carrick-a-Rede rope bridge near Ballintoy. Mitchell, his dad and myself climbed Slemish Mountain and drank Guinness beer, apparently it was a very Irish thing to do. Thursday and Friday, we went to Balmoral show, it was like Agfest but with more activities and less stalls. Things I saw were sheep and cattle judging, shearing competitions, tractor handling, tug of war, a beer tent and side show alley. That Saturday night we went to the Randelstown BBQ which was fun, it was held in a cattle shed with a band and a bar. This was followed by a quiet Sunday with burgers and chips. On Monday Emma Miller (another recent past exchangee to Tasmania) picked me up and we spent the week together. We did lots of activities including Giant’s Causeway, we did the full walk! Emma and I also went to Belfast to see the Titanic Museum and Belfast Castle. Later that week, I went to work with John Cochrane. John is a chippy but works with concrete building now. We did some wall boxing for a chicken shed and laid reinforcing bar down for a shed slab. I planted barley with a young farm member, we worked right on the coast in a 200hp John Deer with satellite guidance, this was very much over kill in the 15 acre fields. I also swam at Port Rush one morning which was extremely cold. Friday night was Sports night where 250 Young Farmers turned up to play soccer and tug of war. On Saturday night there was a BBQ, it was a good evening followed by a lazy Sunday. On Sunday night, I met with Jack Johnston and his mates and we went to Port for a drink. But on Monday morning I got put to work at the Johnston's farm where we milked 280 cows on a 20 aside swing over parlour. We also cut silage so Wednesday was all about hauling silage back from the fields in tractors and chaser bins. Ballymena show was on Friday afternoon. There was a Young Farmer competition that included hockey, tractor handling, ute course, quad bike challenge and tug of war. Saturday was a busy day, a Young Farmer member of Randalstown got married. When the wedding party leave the church, it is tradition to walk through an arch of pitch forks which I was asked to be in. We went back to the second day of the show for some more competitions and to have a better look around. Then back to the Johnston's to milk. I then caught the bus to another young farmer BBQ followed by a quiet Sunday morning and a lunchtime flight to Wales. Leaving Northern Ireland, I flew to Cardiff wales where I was met by Angharad (another past Tasmanian exchangee) and her partner Andrew, they both had the week off work so we road tripped around Wales. 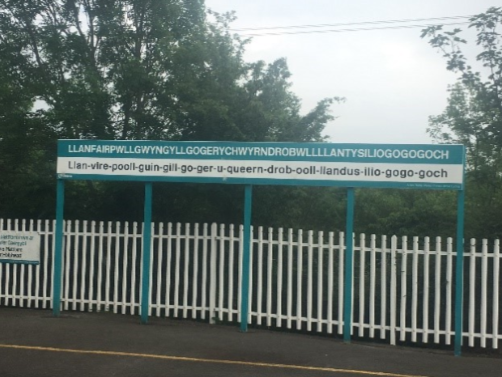 We made many stops including stopping at a town named Llanfairpwllgwyngyllgogerychwyrndrobwllllantysiliogogogoch which is the longest named town in Wales. Also I went to Verdigo zip line which is one of the longest zip lines in the world and holds the record for being the fastest. To fill out the week I went to Angharad’s family farm before a long train ride to Lancaster shire. The train went into Manchester where I was collected by James Davis and taken back to his family farm, then thrown straight into giving a talk to the local Young Farmers club, telling them about Australia and the study tour that I was on. The next day we travelled down south to Lutterworth where a field day for plant equipment was being held, the event was actually held on the Top Gear track. On the way home we stopped at the JCB world factory and did a site tour, it was great to see how the loaders were being made. I left Lancaster via train to Edinburgh on the 12th of June, the trip was delayed because the door fell off the main train but I got to Edinburgh safe and sound. In the Scottish part of my exchange I was part of a group of 16 exchangees from different countries. Different to me as before this I was by myself as a lone exchangee. Edinburgh is a beautiful city built on a hill with lots of rises and stairs. I dragged my bag and suitcase to the street where I was staying, it turns out there are 2 hostels called the Cowgate hostel. On arriving to the first hostel (the wrong one) I met an English girl named Lauren (who was on the exchange trip) she was arguing with the receptionist so when we worked out that it was the wrong hostel we continued to the correct one. Because we checked in at the same time we got put into a share room with a New Zealander girl and an Englishman. That evening we met with Gemma (another past exchangee to Tasmania) for dinner then to a bar for a drink where I met the rest of the exchange group. 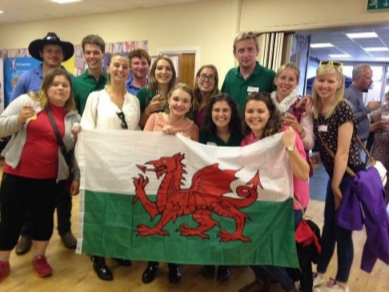 This was the first part of my exchange in a group which I enjoyed, there was 2 English, 2 Welsh, 2 Northern Irish, 1 Irish, 2 Finnish, 1 Swiss, 1 New Zealander and myself to start with. The next day, as a group we went sightseeing to a pick-your-own style farm and shop ironically called Craigie's. We also went out to 5 river bridges and stopped off at the Scottish Parliament. At the Scottish Parliament we went on a small tour into the meeting room, and as young representatives of the world we had a discussion about a broad range of topics including U.K leaving the EU, farm payments from the government, TB in livestock and other issues, it was a very interesting talk. I went to the International Trust dinner on Tuesday night. There was a range of supporters and important people. At the dinner, I had a chat with a reporter from the Herald newspaper so I got a small mention in the agricultural section. Also there I made a quick thankyou speech to the room. The group of exchangees went to Ayrshire where we got spread around host families. My first host was Robert Campbell. He comes from a family dairy and beef farm. 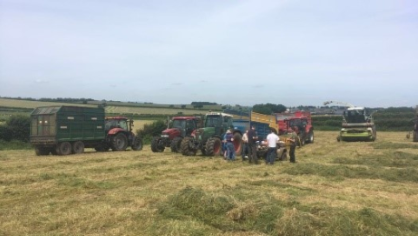 For the week we went site seeing, cut and hauled silage, farm tours and young farmers events. When staying with the Campbell's we went out cutting silage in a 180-horsepower Case with front and one side mower. I got shown the controls, given a test drive and then left to it. The following day I was in a smaller Case with a single side mower. We had a day raking then hauling. I did many loads of silage into many pits, it was a great experience to see how silage is done on the other side of the world. We returned to Edinburgh for the Highland Show. I was staying in the same hostel but this time I had a room with 3 Irish. Through the days we explored the show, of the evenings we went to the Main reception and Exchange reception. At night there were dances and bars for the young farmers. After the show half of the exchangees finished their trips and the remaining went with SSS Young Farmers club, three of us went into a cabin and were collected through the days for activities, sightseeing and club events. I met with James Campbell who was my second host. He works with his dad on a sheep farm, we checked sheep/farm jobs and sightseeing. We went to Dublin for a day and went to a Rhubarb farm tour, farm shop, sports nights and pub golf with the Young Farmers club. Water sports day in St. Andrews east coast beach where we kayaked with a hire company called Blown Away, ironically it was a windy day but very enjoyable. That night we went to a show dance which was a quite enjoyable night. I had a quiet Sunday morning on the couch watching a movie and then a train back to Edinburgh where I stayed the night at a Hostel and then back to England to mark the end of my exchange. I travelled to Oxford to my aunt and uncle where I spent a week recovering, chilling out and planning my next part of my travel. I travelled to the Orkney islands where the Craigie family originated from then down to the royal welsh show and back to Northern Ireland for a week. I flew to Finland to catch up with Nillo one of the guys I was in Scotland with spending a week on his farm. From there to Austria to see Eva (past exchangee to Tasmania) who had Zoe Newman staying with her (another Tasmanian Rural Youth member who was on exchange to Austria) and it was great to hear an Australian accent. I took a train trip to Switzerland which was worth the $300 through the mountains. I met with Christa (yep, another past exchangee to Tasmania), and spent a week with her looking about. I climb part of the Swiss Alps one day there and also bought a swiss army knife. Returning to England a week early I busied myself on my uncle and aunts farm and finding long lost relatives. I flew to Northern Ireland to help a farming family out by building gates. Returning to England I went site seeing around London with Gemma, who flew down from Scotland for the day just to show me around. In conclusion I had a fabulous time and would love to do it all over again.